West declared that he was ‘not scared anymore’ and ‘not scared of the media’. 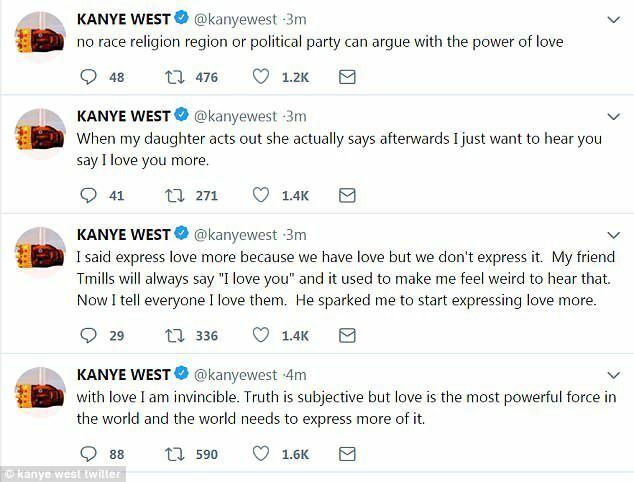 ‘With love I am invincible,’ he continued in a separate tweet. ‏’No race religion region or political party can argue with the power of love,’ another tweet read. West’s Wednesday afternoon tweets began with a proclamation that ‘traditional thinkers’ were locked in a ‘mental prison’. West told his fans he was hitting them with his ‘zig-zag thoughts’ and encouraged them to ‘unlearn linear thinking’, ‘decentralize’, and ‘burn that excel spreadsheet’, phrases that were written in three separate tweets. The tweets came just hours after West confirmed he had cut ties with his longtime manager Scooter Braun. ‘I no longer have a manager, I can’t be managed,’ he tweeted on Wednesday morning. ‘I’m nobody’s client,’ a separate tweet read. Braun confirmed the news on Twitter this week, writing: ‘A man’s loyalty is truly tested when he is willing to stand by someone who will never show that same respect. Later in the day West said he wanted Braun to be part of a ‘new platform’ he was creating. West also revealed he got rid of his last lawyer ‘because he wouldn’t come to work full-time’. ‘I also asked my last manager to come work full time for Yeezy, of course, the last lawyer and manager said no,’ he explained, seemingly referring to Braun. 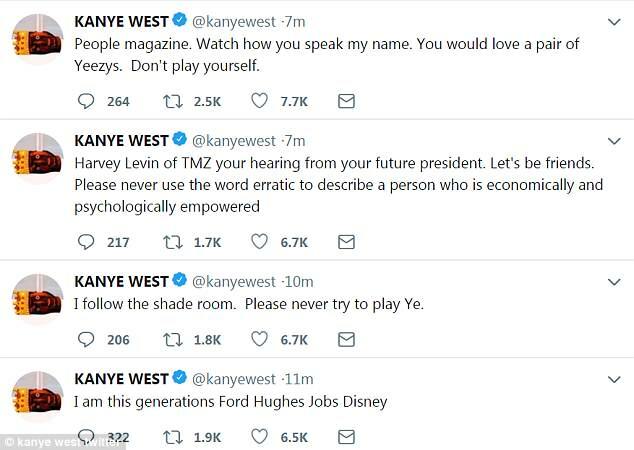 West then went on to declare himself ‘this generation’s Ford Hughes Jobs Disney’, referring to Henry Ford, Howard Hughes, Steve Jobs, and Walt Disney. 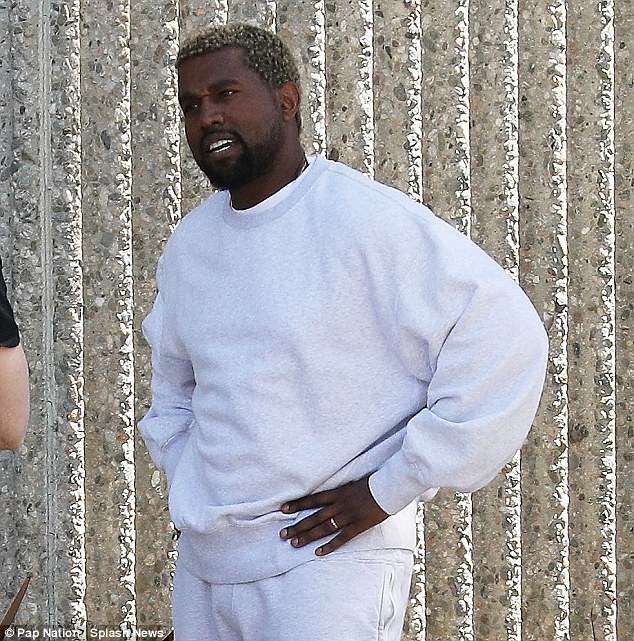 The rapper proclaimed he was the ‘single highest paid person in footwear’ and said his fashion company Yeezy is the second ‘fastest growing company in history’. ‘It is a unicorn on its way to becoming a decacorn,’ he wrote. 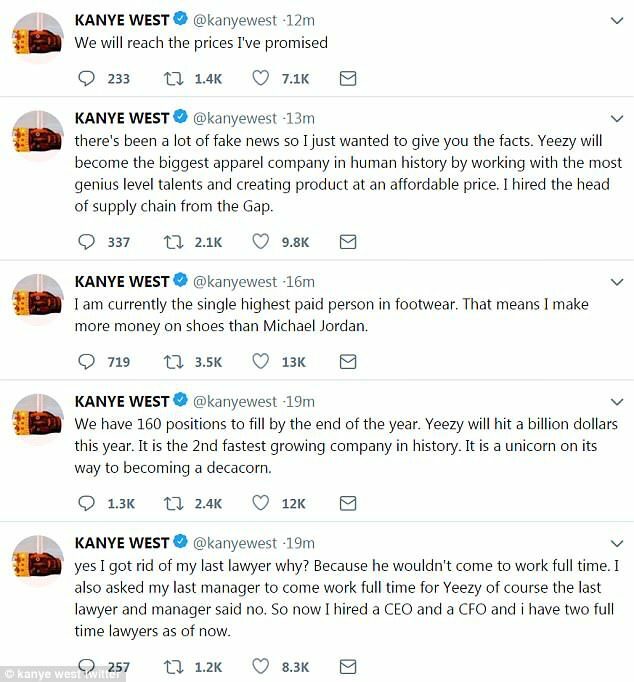 ‘Yeezy will become the biggest apparel company in human history,’ West declared in another post. West’s tweets then turned to the media, as he called out both TMZ founder Harvey Levin as well as People Magazine for recent stories about the rapper. The Harvey Levin tweet was one of two instances in which West referred to himself as the future president on Wednesday. In a tweet that followed shortly afterward, he proclaimed: ‘When we become president we have to change the name of the plane from Air Force one to Yeezy force one’. 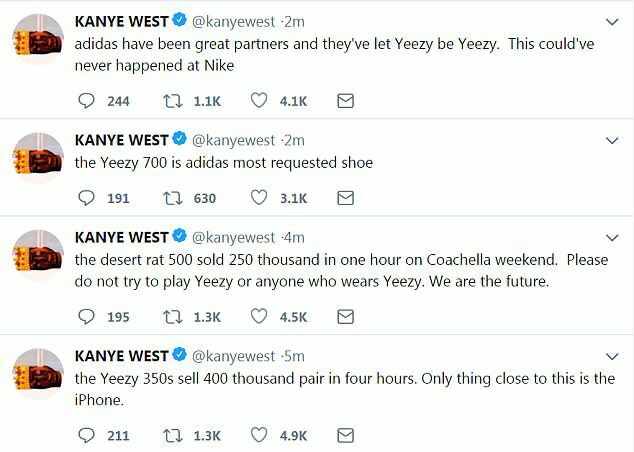 West then tweeted a number of sales figures for his Yeezy brand, proclaiming ‘the Yeezy 700 is adidas most requested shoe’ and ‘the Yeezy 350s sell 400 thousand pairs in four hours. The only thing close to this is the iPhone’. 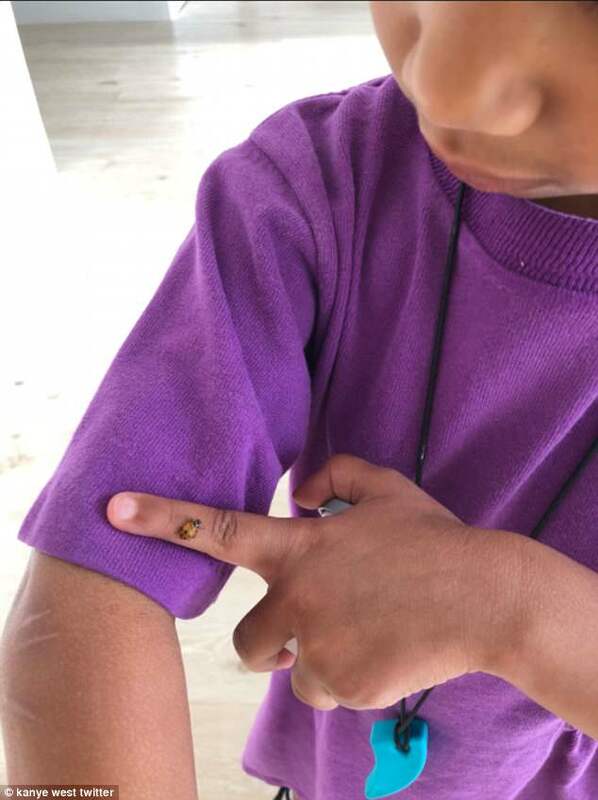 The rapper also tweeted a picture of eldest daughter North with a ladybug as well as pictures of his home, writing: ‘do this look like the sunken place’, a reference to the recent hit film Get Out. 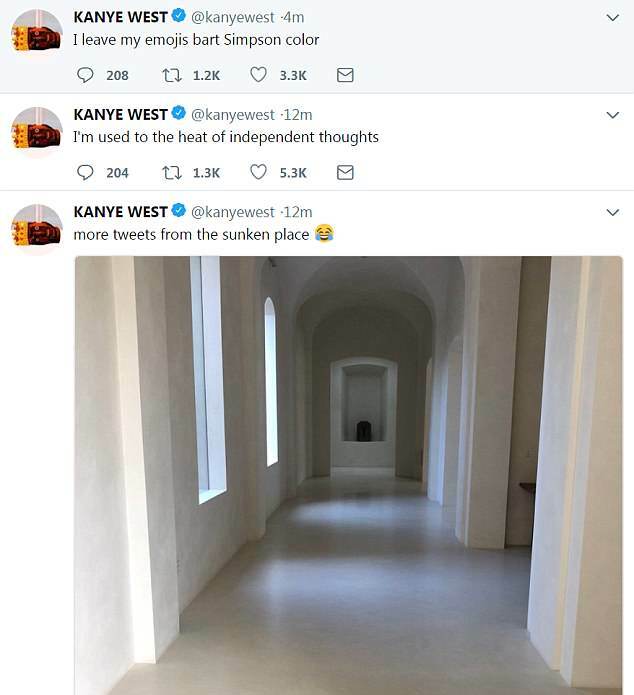 As his stream-of-consciousness tweets continued, West revealed he leaves his emojis ‘Bart Simpson color’, that he’d turn the ‘Grammys into the Yammys’, and that he was ‘nice at ping pong’. ‘I’m used to the heat of independent thoughts,’ he wrote at one point. West also revealed that he had songs coming out with A$AP Rocky, Travis Scott, and Lil Uzi. In one tweet he wrote: ‘Trav we gotta drop the track with me you and Uzi this week bro. Let’s goooooooooooooooooooooooo’. ‘Rocky we gotta release our songs ASAP,’ he said in another. ‘I’m 40 years old and I’m just now becoming my parent’s child,’ another tweet read. 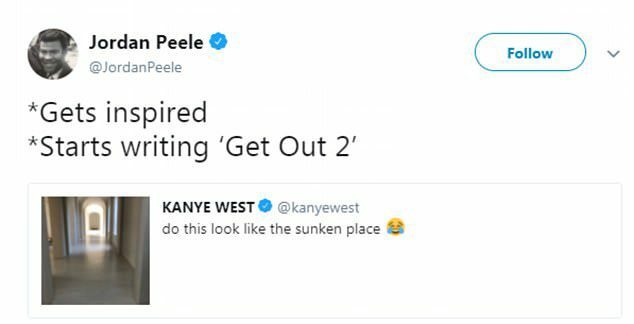 West’s latest Twitter tirade comes just a day after Ebro Darden claimed that rapper had previously battled an opioid addiction. 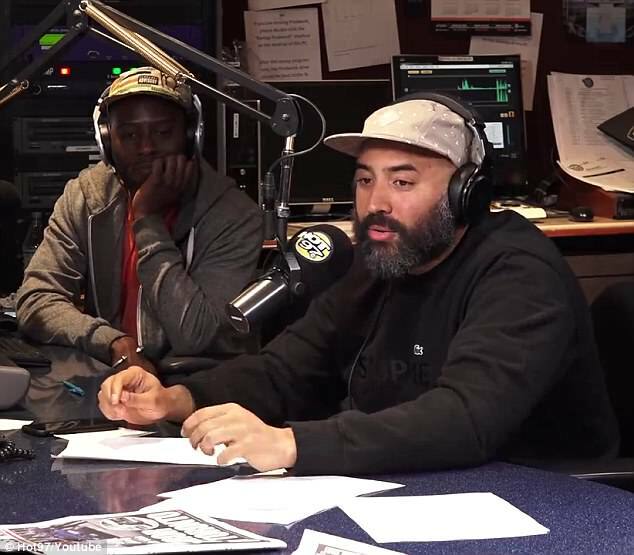 Darden took to his show Ebro In The Morning on HOT 97.1 in New York City on Monday to share the details of an alleged private conversation between him and West. 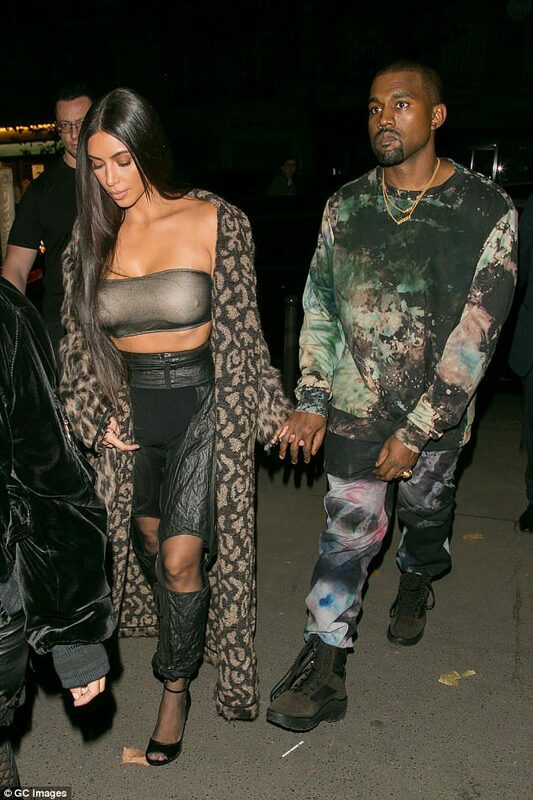 It had been thought that the time that West had suffered from exhaustion weeks after his wife Kim Kardashian was robbed of millions in jewelry in Paris. 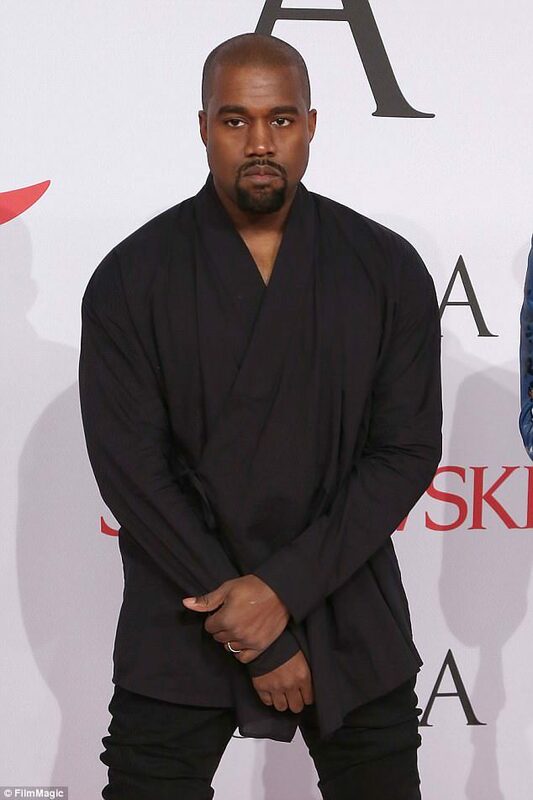 West famously canceled his Saint Pablo concert at The Forum in Inglewood, California on November 20, 2016, before canceling the rest of the tour the following day. During the same show, Darden claimed West said ‘I love Donald Trump’ and complained he ‘couldn’t get anything done’ when Barack Obama was president. ‘I reached out to Obama for years and couldn’t get anything done, but Trump gave me a meeting,’ Darden claimed West said during their private conversation. Sources denied Daren’s claims that West had an addiction and told The Blast on Monday that he had actually been in the hospital for suffering extreme paranoia after not sleeping for over 48 hours. In the same report, sources close to the rapper claimed that people in his ‘inner circle’ are concerned with his mental health. They also claimed West has an acute mental illness which was even used as his defense in the lawsuit against Lloyds Of London over insurance money when it came to his canceled tour at the end of 2016. They said a recent outburst by West at the studio had many worried as he shouted that he didn’t need ‘titles’ and that he could handle his career ‘all by himself’. After saying all business would be ‘handled in-house’ it is claimed that West finished the outburst by saying ‘Yeezy is the new Apple’. 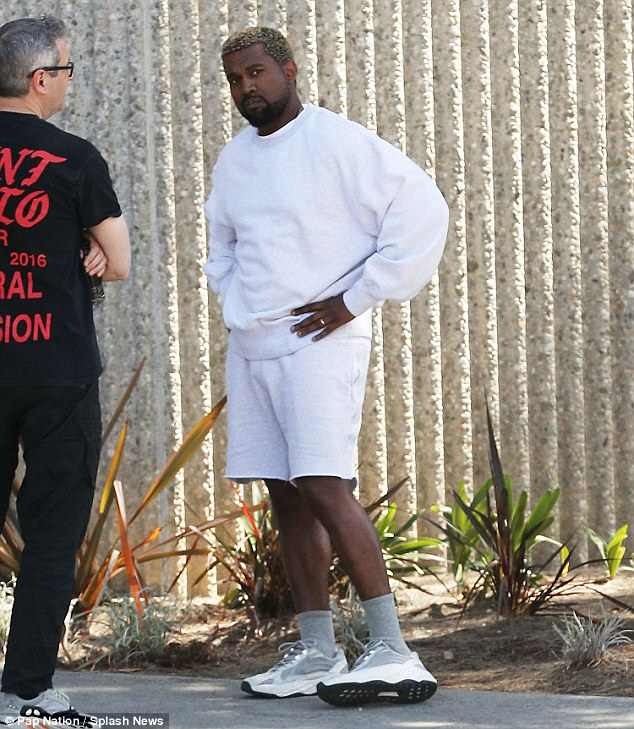 Kanye has had much buzzing since his return to Twitter last week but an insider for the publication said that his comments ‘aren’t making a lot of sense’ to his team. A day after Darden claimed West had an opioid addiction, the rapper called into his show on Tuesday. But whenever Darden tried to ask him any questions, West would simply reply ‘I love you’ before breaking out into Stevie Wonder’s song I Just Called To Say I Love You. West then told the radio host: ‘Meet me up in person and then we can talk afterward but I just called to say I love you’. 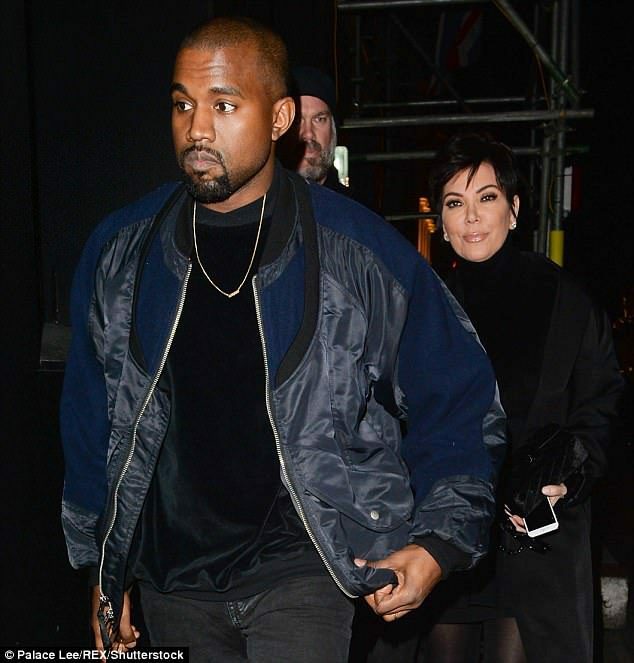 Rumors have also swirled that West’s recent Twitter outbursts have caused him to have ‘huge blow-ups’ with Kardashian matriarch Kris Jenner. A source told People that Jenner has been upset with how ‘erratic’ West is acting and that she’s concerned about ‘her daughter’s brand’. ‘Everyone is really, really worried,’ the source added. 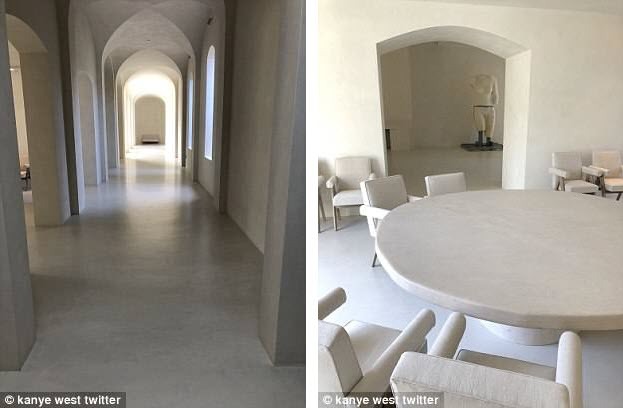 A source said that West has been ‘eccentric and erratic’ and that he ‘genuinely believes he’s God and a genius’, while another claimed he’s ‘all over the place’. But another source close to the rapper said he’s just ‘being Kanye’ and that he likes to ‘stir the pot’.